math-sculpture.com is an online-catalogue of all MO-Labs models. It provides information on the MO-Labs math models and also links to purchase them via our shop on our producer’s website “shapeways.com”. Once you click on one of the “buy now” links in this catalogue, you will be sent to our shop on the “shapeways” website where you may choose sizes and colors, if available, and put the desired variant into your “shapeways shopping cart”. proceed to check out and pay the items in your cart. “Shapeways” will then produce the items for you, and will send them to you really quickly. MO-Labs is a small business focussing on mathematical sculptures and other math objects. We have created many hundreds of different mathematical objects in the past years, many of which only very few people will ever buy because they are quite special. Moreover, we want to offer our shapes in as many materials as possible, so that you will be able to find your preferred material, size, and color. Altogether, this makes far too many different models to hold them on stock. These are the reasons why we cannot afford to have them all on stock and sell them in our own shop. Instead, we use our shop on shapeways.com. You may search the MO-Labs models you are interested in via our website math-sculpture.com. As soon as you find an object you want to purchase, use the “buy now” button which sends you to our shop on the shapeways website in a new window/tab of your browser. There you may choose a size, color, and material, and put it into your shopping cart on shapeways. To get back to this catalogue and continue browsing our sculptures, just switch back to the math-sculpture.com window/tab or close the shapeways.com tab. When you are done with searching for MO-Labs math sculptures, you may use the “open shapeways shopping cart” button above to proceed to checkout. 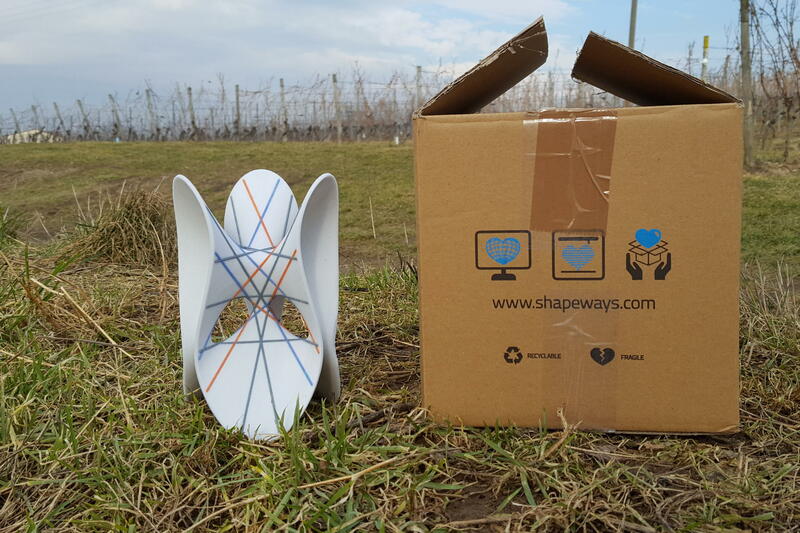 “shapeways” will produce and send the objects to you really quickly, no matter where you are located in the world. For some schools, universities, and other public institutions, it is not easy to purchase via shapeways.com, because they need an official quote and/or can only pay as soon as the object has already arrived. However, shapeways wants you to pay in advance. For such cases, just contact us. We can send you a quote and send you the objects. However, notice that it will take a bit longer than a direct purchase at shapeways. Here is how it works: We produce the objects (often also via shapeways), check the quality of the objects, and then send the objects to you together with an invoice. The last step of sending the objects to you may be more expensive and slower than the “shapeways” shipping price because we are just a small business. In particular, we are located in Europe; shipping to a place outside Europe may take quite some time, and involve additional costs such as customs etc.